That’s right. Two local restaurant reviews in a row. My last post highlighted a favorite breakfast spot; this time we’re moving on to lunch. (So much for building variety into my editorial calendar.) For some reason I’m in an eating out mode lately, perhaps because of an unnaturally busy schedule. And laziness. Happily, the result is that I keep finding myself in restaurants photographing taste-bud-tantalizing vegetarian food. 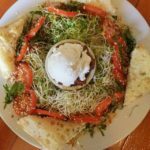 Boundary Bay Brewery and Bistro is an institution in Bellingham. 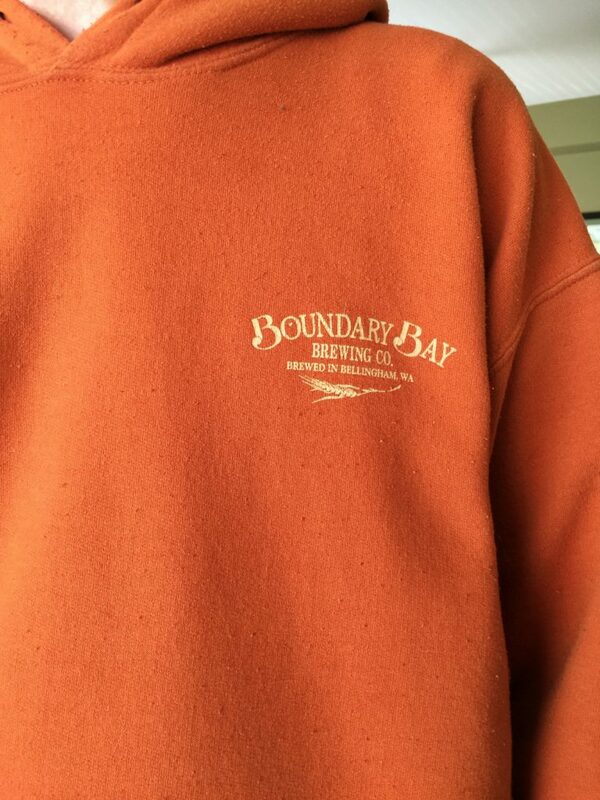 Sweatshirts with their logo are almost a required uniform for locals, especially the students from Western Washington University. Their restaurant is a good spot for families, couples, boys’ night out, girls’ night out, solo dining, or in our case, a weekend lunch for three. My best friend recently returned from a 6-week stint in Hawaii and we badly needed to get together and catch up. So we met up for lunch, and Jeff was free so I brought him along. (A brave man, don’t you think, to voluntarily hang with two women while they update each other on the minute details of the last 42 days?) 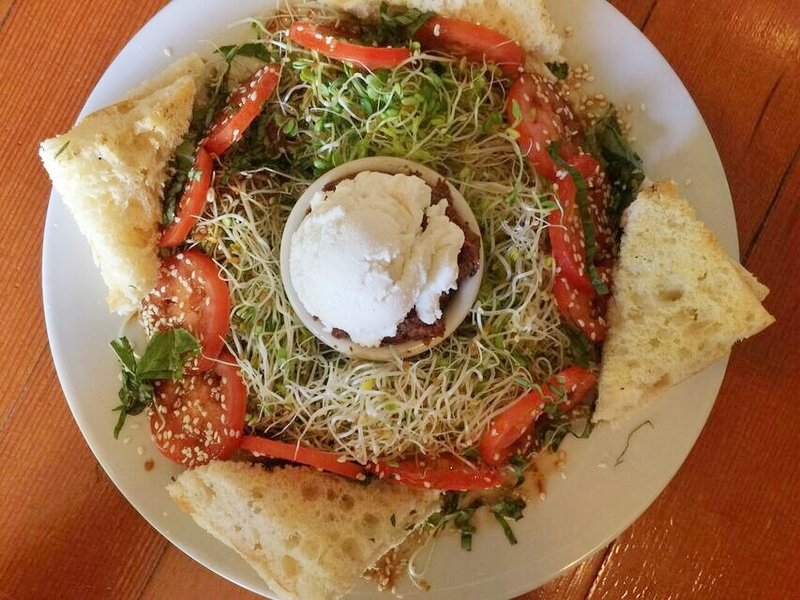 We ordered three meatless menu items, but that’s only the tip of the iceberg at this veggie-friendly establishment. My friend made a meal out of the tapenade appetizer: a blend of Kalamata olives, capers and sun-dried tomatoes served with housemade focaccia and Roma tomatoes. Dressed with a Thai vinaigrette, fresh basil, sprouts and local chevre cheese. The presentation was quite colorful and tempting and made me want to dig right in. Too bad it wasn’t my food. And, good thing my friend is a sharer. I thought the tapenade itself was very nice, and not too vinegary. The sun-dried tomatoes seemed to balance out the Kalamatas, so it wasn’t overpoweringly olivey. And I’ve never had tapenade served with goat cheese before. The creaminess of one spread balanced the piquant bite of the other beautifully. At first, we thought the choice of a Thai vinaigrette seemed odd paired with a Mediterranean-style dish, and wondered how it would be with a drizzle of balsamic syrup instead. But by the end, we’d changed our tune. The Boundary Bay folks knew what they were doing. The tomatoes and sprouts sort of served as a salad and the vinaigrette matched nicely. Our only suggestion would be to serve the dish with more bread. We couldn’t make the tapenade:bread ratio come out evenly, despite our love of math and food. 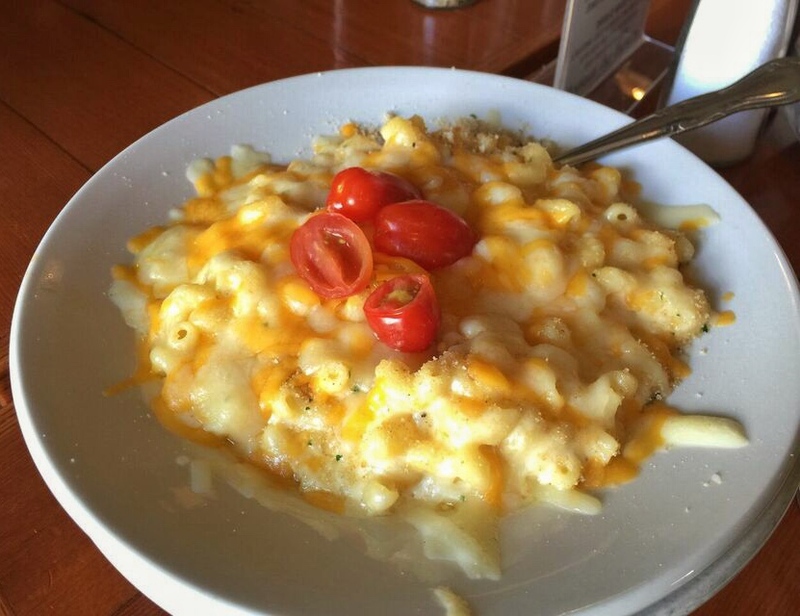 Jeff got the old stand-by, mac and cheese: elbow macaroni with fontina, Monterey Jack, cheddar and Parmigiano-Reggiano. It’s kind of hard to go wrong with a classic. Jeff was impressed that the pasta was still firm, but gently wished for some more bread crumbs on top so he could enjoy the pleasing crunch with every bite. Look at how perfectly brown and crispy that tempeh is. It needed a titch more salt and pepper, but they make it look so darn appetizing, don’t you think? The lettuce was pleasingly fresh and crisp, and a squeeze from the lemon wedge garnish brightened things up considerably. 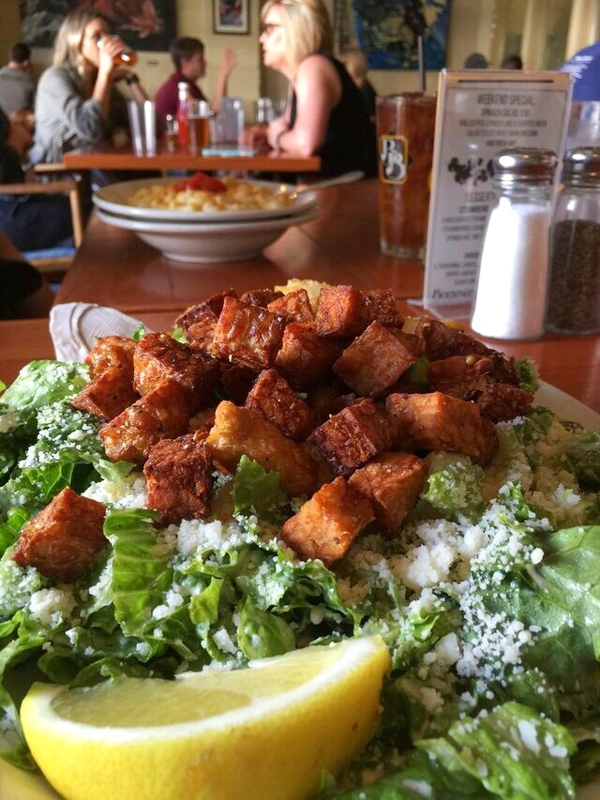 The contrasting textures together with the warm tempeh and cool lettuce meant I never stopped to put my fork down until the plate was clean. I know local pubs are plentiful, but Boundary Bay stands a cut above the rest for me. 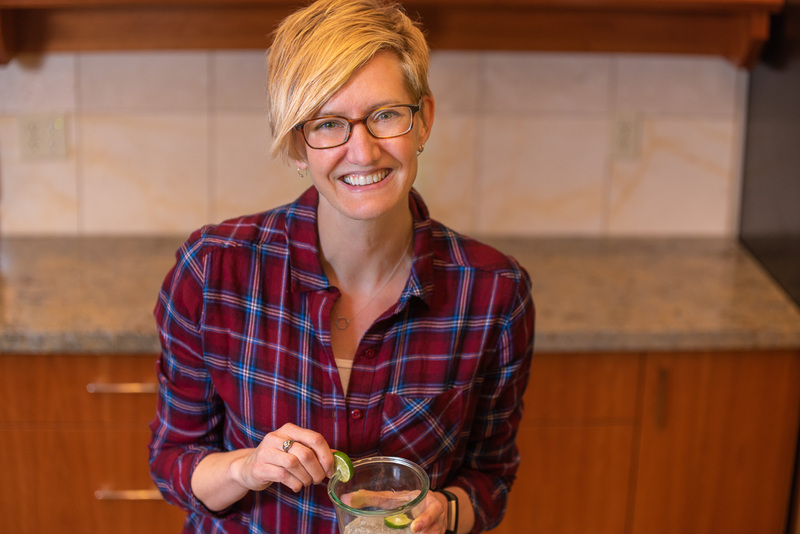 Any restaurant (especially those usually known for serving chicken wings, burgers, and nachos) that makes tofu and tempeh seem like regular fare and has nearly as many plant-based menu items as meat and fish dishes, makes this dietitian happy. The fact that it’s local also makes me a little proud. Do you have a local joint that’s doing it right for the veg-heads among us, but also keeps the regular crowd satisfied?